SinBerBEST seeks to enable flexible, constrained optimization of energy consumption, CO₂ emissions, productivity, safety, comfort, healthfulness, and the entire building lifecycle. Building and operating a collection of Integrated Cyber-Physical Test Beds is a key element in our approach. The newly developed test beds (physical and cyber-physical) are for developing, testing, and ultimately demonstrating the benefits of all the proposed technological innovations and integrated system paradigm. The test beds and related laboratories incorporate the unique characteristics of Singapore: high humidity, constant warm temperature, ample natural light, high-rise buildings, and a highly-connected population. Test and showcase the usefulness and advantages of the novel, hybrid, cyber-physical modeling procedure in this interdisciplinary research program. Verify the actual performance, efficiency, and effectiveness of all the technologies developed in this program, and evaluate the feasibility of applying these technologies to real buildings. Assess the impact of the developed technology on the overall performance optimization of the green tropical building. Provide a comprehensive laboratory infrastructure that facilitates the integration of various thrusts in this effort and the understanding of the interplay between the building, the user, and the energy system. Transform our proposed innovations from idea development to robust design to product maturation and market penetration. Innovative ACB design and deployment. Innovations towards air quality, thermal comfort, visual comfort, etc. Demand-Response, configurable grid interface while integrating renewables, storage, etc. 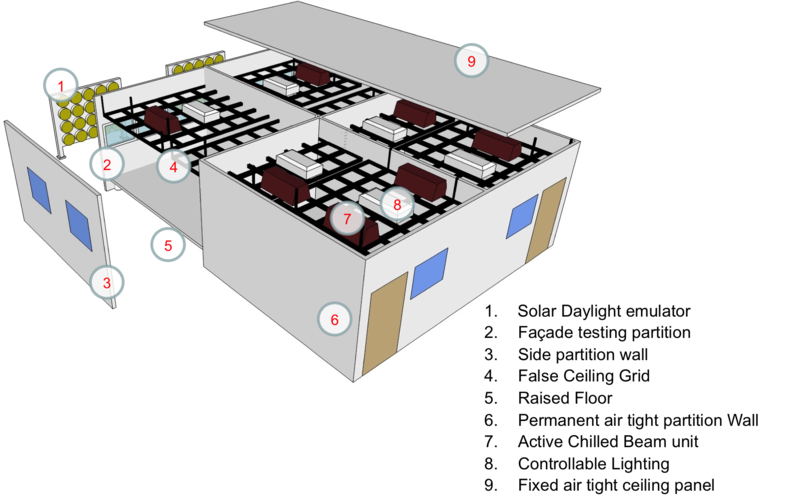 The main structure of this test bed is a fully-configurable, 100m² “building.” It features a fixed raised floor, suspended ceiling, and wall modules on a rail system, allowing for flexible subdivision of space. This structure has fully controlled air handling and sufficient thermal insulation, allowing us to vary its interior temperature from -4°C to +8°C around our nominal 24°C office environment. Additionally, humidity and CO₂ are controllable to simulate various built environments, from aggressively-chilled to naturally-ventilated spaces in tropical climates. The physical structure is a hybrid design that is divided into four subspaces with approximately equal areas. While part of the structure consists of fully movable panels hanging from rails, another part consists of fixed panels with clean-room quality, low emission components. 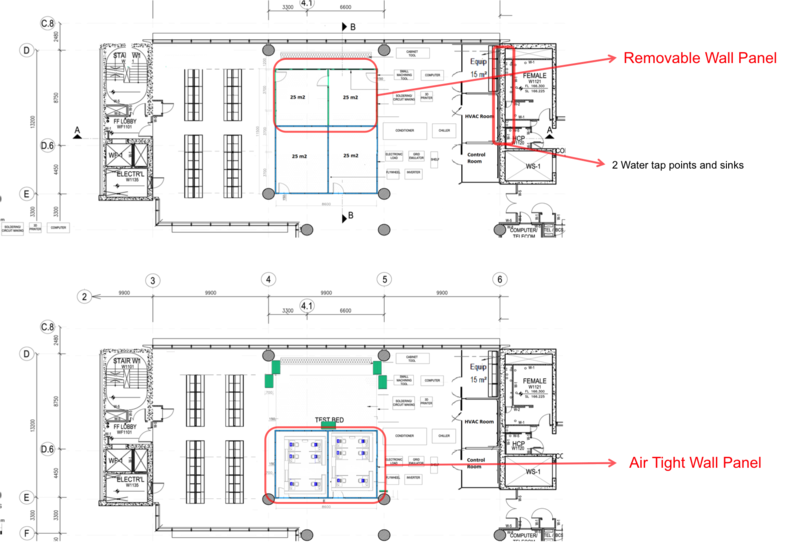 As shown below, we can use quality moveable panels to enclose two subspaces closest to the windows and create a lab for AC and thermal comfort experiments. These panels have relatively inert laminate surfaces, are designed for sound insulation, and provide sufficient environmental isolation with insignificant pressure differentials. We can use part of the structure with a purpose-built daylight emulator to support our experimental, daylight harnessing façade panels. These panels can be interchanged easily by using the ceiling mounted rail system. 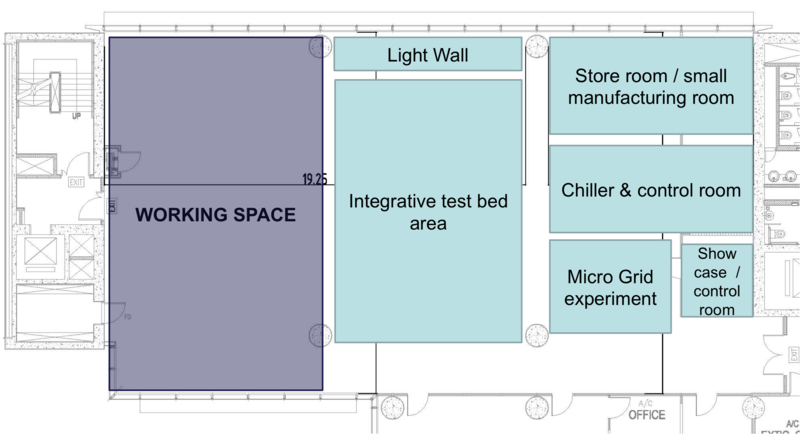 Two of the four enclosed spaces are made of clean-room quality, fixed modular components. This construction allows us to perform experiments on air quality, in conjunction with thermal and visual comfort.